When I started the AlexEatsTooMuch blog and Instagram only four months ago, I really wasn’t sure of my plan and goal. I was really just looking for an excuse to share my love of food and eat new meals at home or at new restaurants. I have done a lot of that so far. I began with the idea I was going to only post about new restaurants and become this awesome foodie about town. I have probably visited like 50 restaurants. However, I learned quick it is expensive to keep eating out every day when you also have real bills and a full kitchen available for use. I created new dishes at home and signed up for some meal delivery services then shared a bunch of those pics. I even enjoyed a handful of beers, cocktails and over indulgences in whiskey. I’m happy to say I’m discovering a lot, but still have a lot to learn, a lot to work on and a lot more to eat and drink. 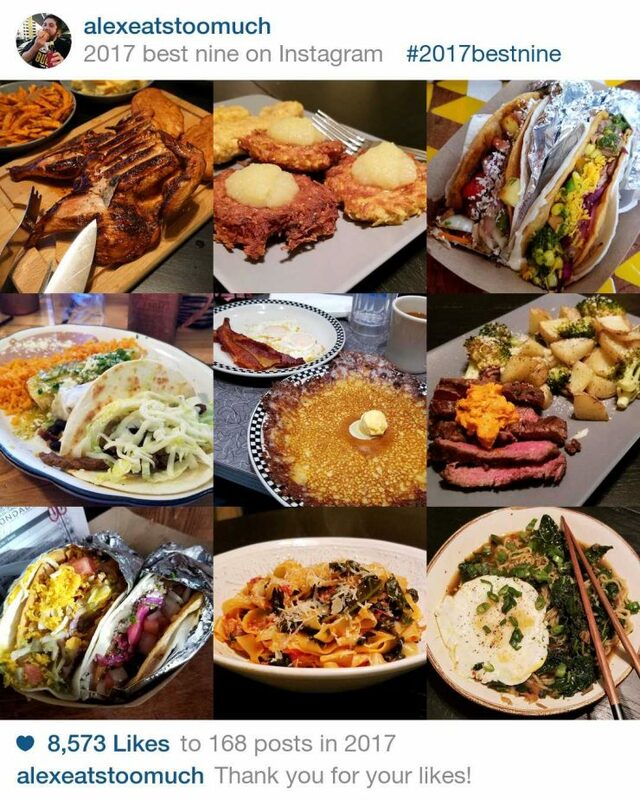 Breaking into the Instagram foodie scene is not easy, especially in Pittsburgh. Although there are a lot of new restaurants, it doesn’t seem like many people in Pittsburgh are flocking to Instagram to find out about those new restaurants. Nor are people posting their own food all the time like in larger cities. There are a lot of people trying to do this Instagram foodie thing in Pittsburgh and this region is not able to sustain this many people doing it. When I started this four months ago, I thought I had done enough research to say go for it, and my research might have been right at the time. However, I have also discovered there are many other people in the Pittsburgh area had the same idea I did to start a food Instagram. I’m finding the Pittsburgh Instagram foodies who are more successful started at least a year ago or more. Restaurants aren’t the only way I’m going to post delicious looking food. I’ve started make more creative dishes at home. I’ve even had a couple “what restaurant?” comments. Photogenic food causes me to gain weight. I’ve probably put on about 7 lbs since I started this Instagram and blog. My preference for fattier foods and dislike for exercise have probably contributed to this issue. I am on the older side of Pittsburgh Instagram foodies, or at least I think I am. It seems based on those I have followed or follow me, many Pittsburgh based Instagram foodies are either still in college or just graduated recently. It has been many years since I graduated college. This made me start thinking about what I want to accomplish for 2018. So I’m setting myself some goals and resolutions. Try at least two new restaurants a month. I thought about setting this to one new restaurant a week, but I don’t think I can guarantee myself being that adventurous on the regular. Write about those two new restaurants every month. Cook something new one time a week whether it is a recipe I find on my own or something from a meal prep service. Share recipes (with source) and reviews of the foods I cook on this site. Attend more food focused events when available. I have found so far, even though the portions are small, some of these events have a wide variety of dishes to try and provide new ideas for restaurants to visit. Collaborate more with other foodies. I want to meet new people. I want to try to work with other foodies and Instagrammers to visit new restaurants or cook together then coordinate sharing photos. Take more consistent photos. I might be my harshest critic, but I would say half my photos are not good and everyone Likes them just to be nice. I need to work on my composition, lighting and just general quality to get to my own standards. Build my following. I had set myself a goal of 1000 followers by the end of 2017. For starting in August, it was very ambitious. I changed it to 500 followers. I got pretty close to that number by the time of writing. I think a reasonable goal for the end of 2018 is 2000 followers. We’ll see how realistic it is. I’m looking forward to an exciting 2018. Keep following to see if I actually keep some of these resolutions. Hold me to them if I’m not. Lastly, if you are a foodie interested in collaborating together, let me know! How Has It Taken Me This Long To Write About Condado Tacos?